An okay movie that soars with style, but unfortunately gets very dull and slow in it’s second half. This film is pretty much what you would expect, knowing that it was directed by Baz Luhrman. This is the guy who made Moulin Rouge and Romeo and Juliet, and he puts style ahead of story every time. For the first thirty minutes or so of the film, this is all very impressive and entertaining, but then it suddenly wears out its welcome. And when it’s time to play in the big boy leage and get serious with his story, luhrman just doesn’t know how to swim. The movie cools off in it’s second half to the point where it often gets pretty slow and boring. the story is good, but it isn’t told in a way that is very entertaining. Instead, time is wasted on unnecesary details and slow moments. This is the story of a small group of characters who live in upper class social circles and have relationships and affaris with each other. it’s definitely interesting material, but it needed a director like Kenneth Branagh (who specializes in Shakespeare) than a director like Lurhman, who specializes in style. The Great Gatsby could have been a fantastic movie. It really should have been too. Who better to direct a film about lavish parties than Baz Luhrman, the guy who made Moulin rouge and Dicaprio’s Romeo and Juliet? Lurhman is an artist if ever there was one. And when it comes to cinema, that’s not always a good thing. there are some guys who put art ahead of storytelling. Guys like Terrence Malick (Tree of Life was painful), or Michael Mann (other than heat, his movies tend to be filled with too much excess detail.) unfortunately, Baz Lurhman is one of these guys. It’s not easy, knowing how to tell a story and to keep the audience interested the whole way through. At least with Luhrman’s films, even if the story or telling of it doesn’t work, the style is still fantastic. This was the case with all of his other films. Moulin rouge is probably his best work, but even there, the story was pretty routine. The style for that movie, however, was a thing of sheer talent. Luhrman really goes for the same kind of thing here, with the Great Gatsby. When Nick Carraway, (Tobey Maguire), the star and narrator of the film, arrives at Gatbsy’s house for his first party there, it’s as if he just stepped into the Moulin rouge. There is so much going on all around him, in ever direction. And I really like that the cuts are not fast, like Michael Bay style and all those who copy him these days. we need time to appreciate what we are seeing and Luhrman knows that. the first thirty minutes or so of the movie are very good. this is all setup, and it’s where we get to learn of the different characters. there is nick, who is recounting the story of what happened to him to a doctor at what seems like a treatment clinic or mental institution. we go back in time to see new york in the 1940s, after world war II, when the city was hopping. lurhman does elaborate tracking shots and uses computer effects nicely to take us right in and out of the city. he also has fantastic music at his disposal (three fun songs by JAZ,) AND BLENDS PRESENT DAY MUSIC TOGETHER WITH THE MUSIC OF THE TIME, VERY NICELY. WE LEARN OF HOW NICK LIVES OUT ON LONG ISLAND, AND HIS COUSIN, DAISY, LIVES WITH HER HUSBAND, RIGHT ACROSS THE WATER FROM HIM. NICK STARTS HANGING OUT WITH DAISY (CARREY MULLIGAN) AND HER HUSBAND (JOEL EDGERTON), AND GETTING INVOLVED IN DISCUSSIONS WITH THEM. THEY SPEAK FO THE MYSTERIOUS MR. GATSBY WHO LIVES RIGHT NEXT DOOR TO NICK. TOM BUCHANAN (EDGERTON), AND NICK START TO BECOME FRIENDS AND SPEND TIME TOGETHER. THEY GO INTO TOWN TO GET TOM’S CAR LOOKED AT, BUT ALL HE REALLY WANTS TO DO IS SPEND TIME WITH HIS MISTRESS (ISLA FISHER,) DESPITE HER HUSBAND BEING AROUND. TOM INVITES A WHOLE BUNCH FRIENDS TO COME OVER HIS HOTEL ROOM FOR A BRIEF PARTY, AND BY THE END OF IT, MYRTLE (ISLA FISHCER) IS GIVING HIM A HARD TIME ABOUT LEAVING HIS WIFE, DAISY. THIS SCENE ENDS IN VIOLENCE THAT DISTURBES CARAWAY, AND MAKES him turned off by what he sees from tom. if carraway is looking for a new friend, after seeing this side of tom, then he finds it soon in mr. jay gatsby. now we don’t see gatsby for at least the first thirty minutes of the film, which is a little strange. we pretty much meet every character before we meet him, including tom’s mistress and her husband. but there’s a reason for that. the longer we don’t see gatsby, the more we get to hear about him and what people think of him. there are all kinds of legends and rumors going around about him, and this contributes to building up his character as a man of mystery. when we finally do meet him, it’s at one of his parties. now this is the first place where the movie starts to turn. it was great up until now, and the party starts off fantastic, with wonderful imagery and ideas. but it goes on way too long, and loses it’s momentum. if lurhman had it his way, the whole movie would take place at this party. this is his opportunity to make the film like moulin rouge, and he makes it last as long as he possibly can. we meet gatbsy (dicaprio, who is pretty good in the role), and learn of his intentions. gatsby used to be romantically linked with daisy before he went off to war. he felt that he needed to prove something to her, and to make some real money before he could ask her to be serious about him. only while he was away at war, she met tom and got married to him. now, gatsby has bought the place across the water from her, so that he can see how she is doing. he wants nick to set the whole thing up, inviting daisy to his house for coffee, where mr. gatsby will surprisingly show up. that scene, where gatsby and nick wait for daisy, is a great one. gatsby has the house decorated with flowers, both inside and out, and he sits nervously looking at the clock, thinking daisy might not be coming. when she does arrive, we steps out the side door, into a rain storm, before coming in the front. when he enters the house, he is soaking wet. he probably left because he wanted it to look like he just happened to be stopping by, but it also helped cool down his nerves. or maybe he did because his nervousness was making it so that he couldn’t think right. 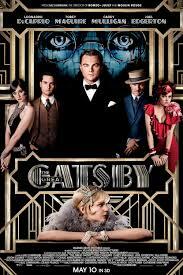 daisy and gatsby get together, and the rest of the movie goes downhill fast. we are now about halfway in, and the second half really plummets. the relationship between daisy and gatsby just isn’t interesting. the movie gets back some of it’s momentum in it’s final scenes, as characters finally confront each other and then there’s a horrific climax. but once the movie loses us, it never really gets us back. 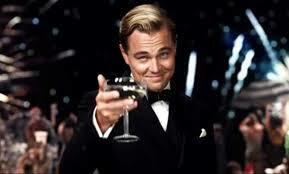 the great gatsby is a book with a good story to it, about social circles and parties. the problem is that baz luhrman is not such a great storyteller. he is an artist who specializes in stylye, and so we get a number of scenes, for example, where a character is writing a letter, and the handwriting comes up on the screen. as if that is contributing to the movie in any way. luhrman should have been a lot more focussed on how to tell his story than on things like this. the movie is okay, but it should have been a whole lot better.